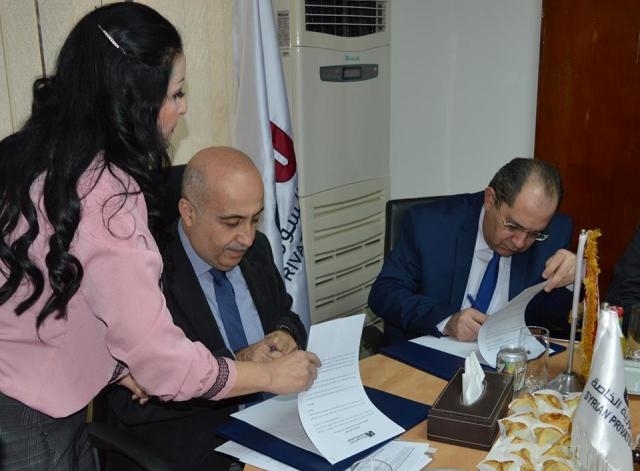 The Syrian Private University renews scientific and academic cooperation agreements with Damascus and Zahrawi hospitals. The President of the Syrian Private University Dr. Nazir Ibrahim met the Director of the Damascus National Hospital, represented by Prof. Mohammad Haitham Al-Husseini and the Director of Al-Zahrawi Hospital, represented by Prof. Rafael Attallah, on Wednesday, 5/12/2018. In the office of the Presidency of the Syrian Private University in the presence of the Vice President of the University, Prof. Mohammad Riyadh Al-Ghazi, the Dean of the Faculty of Medicine and its deputies and the Director of the Office of the President of the University to renew cooperation agreements with the two hospitals. The university president welcomed the attendees and thanked all the medical and administrative staff in the hospitals. He also expressed the University's desire to develop joint work and clinical training for the students of the Faculty of Medicine. He also talked about the medical scientific research published on behalf of the university and the impact it has had on the excellence of the university outputs and the impact of training in hospitals at the level of students in the Standardized National Medical Exam. The University President also presented certificates of thanks and appreciation to Dr. Wadad Al-Ajji, Dr. Alaa Dirani and Dr. Ahmed Abbas for their efforts with the students during their training in the hospital. At the end of the meeting, the terms of the agreement were revised and renewed for a new academic year.